Long Hours, Low Pay Push Some Democratic Campaign Workers To Unionize "It's been far too long that workers in this industry have been exploited," said Ihaab Syed, the secretary of the Campaign Workers Guild. 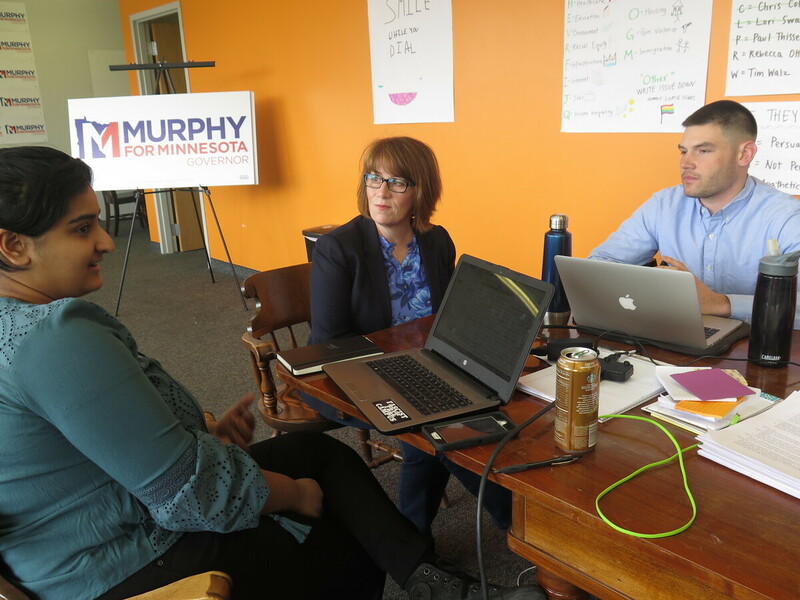 Campaign staff member Aisha Chughtai (left) speaks with Erin Murphy (center), a Democratic candidate for Minnesota governor, at the campaign's St. Paul headquarters as colleague Charles Cox looks on. Chughtai and Cox are members of a newly formed campaign workers union. Many political campaign workers spend long hours at low pay, living off of pizza and coffee, all in the hope of seeing their candidate win. Now, labor organizers are setting their sights on bringing those workers into the labor movement at a time when the percentage of U.S. workers who belong to a union is falling steadily. The newly formed Campaign Workers Guild claims to have helped organize at least a dozen Democratic campaigns and one political consulting firm. "It's been far too long that workers in this industry have been exploited. And now we're finally standing together to put an end to that," said Ihaab Syed, the union's secretary. One of those campaigns is Erin Murphy's, a Democrat running for governor in Minnesota, the first gubernatorial campaign in the country to unionize. Aisha Chughtai a field organizer for Murphy, says the job is demanding and doesn't lend itself to a nine-to-five shift. But ever since signing on with the Campaign Workers Guild, she's minding her schedule a bit more closely. "Now I get a day off every single week where I am not allowed to be in the office. I'm not supposed to be working. And I don't. It's great." Chughtai is one of six full-time employees on Murphy's campaign who formed the union last month. Worker empowerment, Chughtai says, not job dissatisfaction, motivated the unionization drive. "I think we should break down the idea that unions are only useful to go after bad bosses." Brief, cordial talks with the campaign manager resulted in a first contract. There's a base wage of $21 an hour with paid sick time and health benefits that now include dental and vision coverage. Harassment guidelines are spelled out. Members pay $30 a month in dues. The candidate is on board with her staff joining the Campaign Workers Guild. "I thought this is awesome. And I still do," said Murphy, a state legislator who used to be a union leader with the Minnesota Nurses Association. She's one of three candidates vying for the nomination of the Democratic-Farmer-Labor Party (yes, labor is in the party's name). She says having a unionized staff shows she's serious about collective bargaining rights and she's not worried the labor contract will hamstringing her campaign. "I want people to come to a campaign because they share my values. I know how hard everyone in this campaign is working. One day of rest is going to make them more productive, healthier and we're going to be more effective because of that." But unionizing campaign workers isn't something that Democrats are universally embracing, despite the party's close ties to organized labor. "A political campaign is different. It's a cause," said Steve Hildebrand, who spent 26 years managing campaigns, including serving as deputy national campaign manager for Barack Obama's successful presidential bid in 2008. While Hildebrand says he embraces the goal of assuring workplace dignity and proper compensation, "Political campaigns are short-term gigs. They're not long-term operations, so this idea of unionization for an eight-month job, it just doesn't make a lot of sense." While Hildebrand is now out of the campaign business and runs a cafe in South Dakota, he's concerned the 2020 presidential campaign will be the next frontier for union organizers. "Going into the general election if you have a campaign team that is not putting in 80 hours a week on the Democratic side, you're probably going to lose." While unionizing campaign workers may be a short-term boost for organized labor but long-term, Hildebrand says it could weaken unions further. "What I would tell labor unions is that if you put pressure on political campaigns to organize and build unions there's a great chance they're going to lose and there's a great chance there is going to be no one there to fight your battles in Congress, in the Senate and at the presidential level." Still, Chughtai, the staffer on Murphy's campaign, says she hopes the Democrats running for the White House in 2020 invite unionization. "I sure hope this is a litmus test. Right? It should be." Would she take a job for one without a union? Sure, she says, but her first step would be to organize that campaign.